Copyright Amendment Bill passed - SABC News - Breaking news, special reports, world, business, sport coverage of all South African current events. Africa's news leader. Hundred and ninety-seven Members of Parliament voted in favour of the Copy Right Amendment Bill. The National Assembly has passed the Copyright Amendment Bill. This only happened after a second round of voting. The Bill could initially not be passed due to insufficient Members of Parliament in the House and the decision had to stand over. The Bill seeks to among other things, align copyrights with the digital era and developments at a multilateral level. It also seeks to protect the rights of artist and creative writers. Opening the debate on the bill Parliament’s Trade and Industry Committee Chairperson Joan Fubbs says the Copyright Amendment Bill will improve the lives of many artists, musicians and writers in the industry if it becomes law. Fubbs outlines some of the benefits of the Bill for the industry. The Democratic Alliance (DA) says the Bill will not pass constitutional muster and objected to it. DA MP Ghaleb Cachalia says there needs to be a balance between copyright owners and copyright users. The Economic Freedom Fighter‘s Natasha Ntlangwini supported the Copyright Amendment Bill and criticised those who oppose it including some academics. “These professors they were consulted and and asked to be part (of the process). In fact you know what they are doing now? They are just writing the negative. They all run away from the Bill. They would, no this thing is too complicated we can’t do it. But why is it complicated for them? Now we are having a bill in its form, they are objecting to all of it. So the narrative and the facts that the DA is finding, – is those people we asked them come and work hand in hand with us on the bill, but they refused to do it. “The EFF welcomes the Copyright Bill so far as it deals with out-dated aspects of the 1978 Bill. And last, – South Africans will become to begin to move towards modern laws that government copyrights. It is important to protect writers and artists to make sure that they get recognition and reward for their work, because for so far too long we have seen artist who die poor while the people continue to enjoy their work,” Ntlangwini explained. After MPs voted for the Bill in the first round the results revealed that there were insufficient MPs in the House to pass it. These were the results given by Deputy Speaker Lechesa Tsenoli on the outcome of the votes saying a majority of MPs were needed in the House to pass it. The Bill was only passed successfully after a second round to voting was conducted. 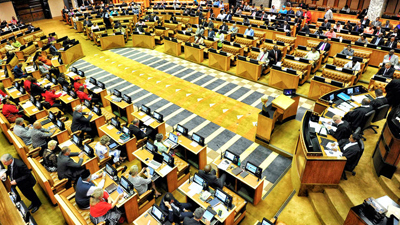 The request to vote on the bill again was made by ANC Chief Whip Jackson Mthembu after more MPs returned to the House later during the plenary session. But DA Chief Whip John Steenhuisen and his deputy Mike Waters objected to Mthembu’s request, saying it was not permitted in terms of the National Assembly Rules. This is what transpired between Mthembu, Waters, Steenhuisen and the Deputy Speaker Lechesa Tsenoli who to took the final decision. The Bill was ultimately passed with 197 MPs in favour of it. Four voted against and there were no abstentions. The Bill will now be sent to the National Council of Provinces for concurrence. Other parties that supported the Bill include the National Freedom Party. The IFP and Freedom Front Plus were opposed to it. The African Christian Democratic Party had reservations indicating that certain concerns raised by some of the academics on the bill, should first be addressed. This entry was posted on 05 Dec 2018,09:59PM at 9:59 PM and is filed under Politics, News, Homepage Featured Story Slider. You can follow any responses to this entry through the RSS 2.0 feed. Both comments and pings are currently closed.